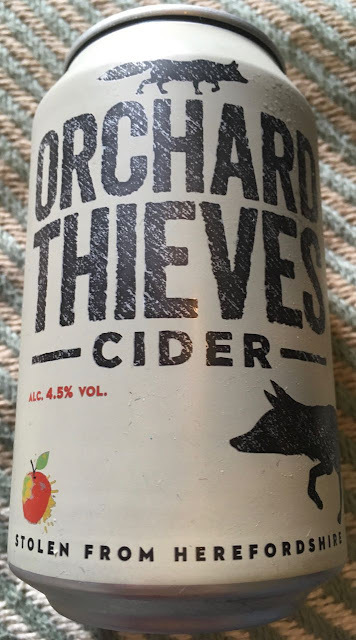 This Orchard Thieves Cider by Bulmer's in Herefordshire is named after the foxes that apparently hunt the finest apples off the cider maker's trees. I had no idea foxes like apples, I thought they just eat meat. Apparently urban foxes have a varied diet of vegetables and bugs! We live in the fairly leafy suburbs of a city's urban sprawl in the middle of England over fifty miles north of Hereford. Here I have a different relationship with the fox that lives in the dense undergrowth at the back of the garden. I saw how thin he or she looked some months ago when I spotted it wandering around in the dim light of an early evening. Since then I've been leaving left over scraps out from our dinners. The fox eats especially well if we've been to the chip shop and I leave it the bones from Cinabar and her mom's chicken and chips, and the odd leftover sausage. We also have an apple tree, so if they do like them, he won't go too hungry! On opening this 4.5% volume Orchard Thieves Cider there was a light and cheerful carbonated fizz. There was a tart apple smell from the top of the can. This cider definitely has a crispness to it. Full of flavour from start to aftertaste. It packs a punch on first biting sip and smoothes to a lovely cider apple finish. This craft cider is very refreshing and would go well washing down a roast pork meal, or with my favourite pork scratching snack, or just on its own kicking back with a good book.